Finally I figured it out. After scrambling around like a chicken without its head trying to figure out what I'm forgetting- I wrote everything down in its place. Not that I'm big on order or anything, I just can't remember what the f*** I'm doing, especially in the panic right before a trip. I'm usually working double time at work to get everything done before I leave. Good thing summertime is usually slow for my business. This is a package deal. Everything I want for the next month or so has to be found (another story) and packed up. 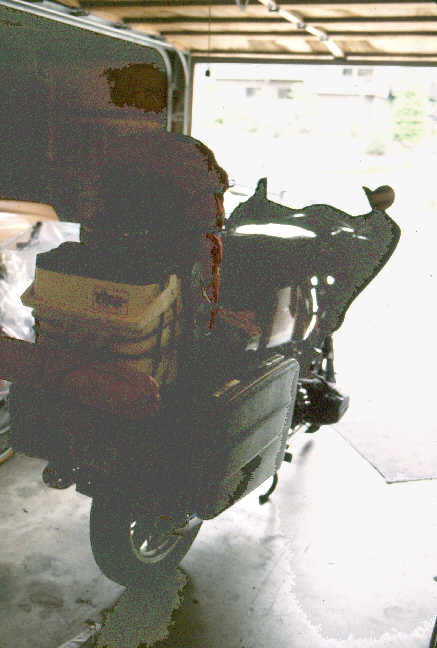 I've got left and right saddle bags, a tank bag, a backpack that straps to a small Coleman cooler, both rest on a homemade tail rack, all secured with bungee cords. 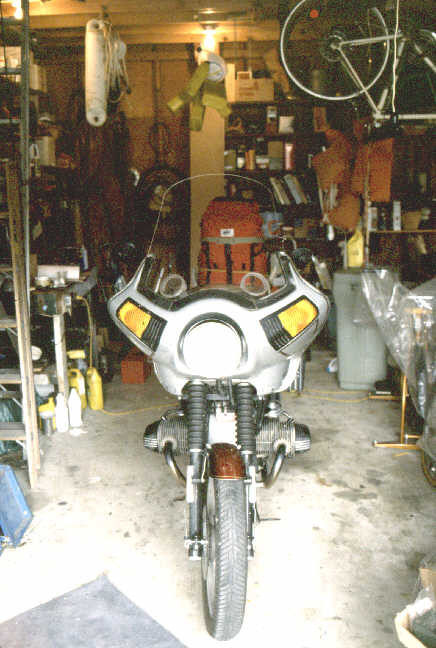 There's also room in my faring, a Windjammer I fit to my R100S years ago along with longer handlebars. The R100S has short bars and a small cafe faring. BMW makes an integrated tour faring but my complaint is there is hardly any stuff space in them. Not well engineered by those who are usually brilliant. The Windjammer has plenty of room and offers lots of protection. You'd be nuts to attempt touring without a faring. So, for what it is worth, here's my full packing list. Maps- each state, one over-all. Or collect them as you go. I've kept a running journal of all my trips. It's fun to bring along in case we can't remember something in the past, we can look it up, it's usually written down. After 20 years it gets sort of thick, and you want to keep an extra copy home. Camera(s)- Canon A-1 SLR w/ 28-85mm lens, extra len(s), lens paper, soft cloth underneath. Film- color slides, I like Ektachrome. Buy it long before you leave, especially these days. Sometimes I bring a second camera B&W camera w/accessories, maybe flash, extra batteries. Though I've now joined the modern age and now have a couple digital cameras. Still, there's nothing better than a color transparency. I scan then at 36 MB, about three times the resolution of a high-end digital. Rooti usually brings a little boom box he has hot wired to his bike battery. Fishing bag- Fly reel, fly box, leaders, etc. Tools- tool kit, ratchet + sockets, scissors, tire patch kit, air pump, spare set of spark plugs, extra electrical components, wire, plugs etc. Fly fishing rod, 4 piece in tube. good sharp knife w/ sharpening stone- a must! Barbecue Grill- (fold up camping grate), about 10" x 15", fits inside my saddlebag door, sub-grill (to keep coals off wet ground), charcoal briquettes- Kingsford, the best, it works. Match-light or reg light w/ gas (more fun). Barbecuing is my favor method of cooking. A good grill set-up is essential to its success. The trick is to keep your coals up off the cold wet ground! Start the coals half an hour before you begin to cook- allow them to turn white all over and use enough fuel to get them going. I use three stones to hold the grates, allow air to go under the sub-grate. Being able to adjust the height is an advantage. Store grill in newspaper, thick (4 mil) plastic bag. Nests inside my kitchen saddlebag. Fires- a good campfire is a necessity. Gather (or buy) good dry wood. Never ever expect anything green to burn well. Hunt around for wind-fall, find dead branches that snap when you break them. An ax or better yet a saw are handy items. Often when its allowed, we'll run up the trail a bit and find a standing dead tree, fall it (sometimes with just a push) and yard it back to camp (behind the motorcycles). Wood coals can be used instead of charcoal briquettes- but use the coals, not the flame. Food- I start off with the above items gathered from home, more likely you'll have them on hand and you won't often find the small quantities you need out on the road- so I use a little forethought and save both time and money. Maybe take some canned goods (ones you know you will use), PB&J, cookies, chips, whatever you have room for. Of course that's always the fight. Be careful that you don't over buy and find you have nowhere to store it. Good thing there's lots of room in the faring. Take an extra duffle bag for grocery runs. Cooler- for food, and okay, a few beers. When there are two of us we split a small bag of ice per day. Menu- hot dogs and beans? Forget it! How about some nice juicy steaks, chops, ribs (my favorite!) chicken, fresh produce... Buy them when you can, be careful with ice and don't let water spoil your good food. Keep them on top of canned fruit, pop, pudding... in plastic zip bags or Tupperware. For lunch make sandwiches, crackers & cheese, leftovers, Top Romin soup on a clod day- much better than waiting in some restaurant for the waitress to come back. Okay, every once in a while we eat out but where we are going, usually there's not much of a choice. For dinner, BQ meat (ribs, chops, chicken, steak), rice, baked potatoes, soup, salad, spaghetti, tacos, burgers, you name it. There's no reason to rough it just because we're on motorcycles. Before you leave- I'm always trying to remember what I forgot. We live at the bottom of a big hill. By the time I get to the top, about a mile, if I haven't remembered something I stop worrying about it. Eventually it will show itself and I can either live without it or buy a new one. It's not worth worrying about. Hey, I'm on vacation. I forgot my underwear once- and toothbrush. Found things- My garage is full of odd mementos I've found on my trips. Some were sought, others just showed up. A TV remote control. A chunk of plaster from Garrison railroad depot (while being torn down). Rocks, stones, redwood chip, buffalo fur, crow feather, beer bottle caps, a very large nail, old faring parts, camping/hiking permits, various BMW motorcycle parts, a fishing bobber. You know, stuff that makes a garage interesting. Pre-function- It takes about a full day to pack up. I'm usually changing oil and fluids beforehand too. One year I discovered a crack in my faring, a large one, noticing I could see the floor when I was digging around in one of the side pockets. It's a good thing to discover these things well in advance of a trip, not the day before. Rooti, ah, I'm going to be a little bit late. The LIST- It really helps to have a list. Of course if you are just going out for a weekend I agree you don't need all this stuff. But if it's for a month, a week and a few days, you might as well be prepared.